It does appear that when some people stop chatting with their dog, it's often lot more than the mouth of stops moving! It's their entire demeanor.The handler's body stops talking too and that overall change in demeanor suggests...disconnect! It's much more than silence. And that does not need to be the case at all! Indeed, it should the opposite. 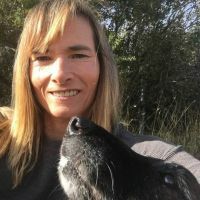 Once you go silent, you should be consciously thinking about your alternative forms of connection - how will you stay fully conscious and connected to your dog when the verbal interaction stops? Let's take a moment to consider how we communicate connection when we're not talking. Let's think about that. When you are interacting with another person and they are doing the talking, how do they know that you're still connected? Where are you looking? What is your expression? What is your demeanor? Do you look relaxed and engaged, or fidgety? Are you looking at the person or looking away? Are you glancing at someone else? Now let's consider your dog within work. When your dog is working then your dog is doing the talking. The appropriate response may well be silence! But silence does not mean disconnect, so ask yourself the same questions that I asked above when you are engaged with another person. Where are you looking? You should either be looking at your dog or using your gaze to indicate mutual involvement in the activity. For example, when I throw my dumbbell, I look at the dumbbell as I send my dog. And as the dog returns, I look near my feet because that is where I want the dog to go, so if you think about it I am maintaining communication throughout, it's just nonverbal communication. For a human example, if a person were showing me a piece of art, my gaze would go back and forth between the person and the art. Same with the dog. I have seen people in the obedience ring staring off at the horizon with a blank expression and a stiff posture. What is the purpose of that? It's clearly not connecting with the dog or communicating a mutual interest. It just looks uncomfortable and....disconnected. What is your expression? Because people have a tendency to give power to the judge in the ring, their expression often suggests connection with the judge rather than connection with the dog! If you're not sure if you do this, watch a video. Who appears to be getting the bulk of your attention? The judge as they give you directions? Or the dog who is your partner? You can absolutely attend to the judge's direction and maintain a connection with your dog. It's the same as a three-way human conversation; you continuously maintain a connection with all parties but one of them is getting the bulk of your attention at any one time. And in the world of dog sports and formal competition? The bulk of the attention should be on your dog with the judge as a peripheral player. What is your posture telling your dog? Are you relaxed? Pleasant? Attentive? Or does your body scream stress? Hardness? Worry? Yes, your dog reads all of these things! Check out this photo of Sarah and Pirate. The sense of connection is obvious; no words required! Maybe today you want to do a formal run through with your dog. Videotape it! Now compare that to informal training with your dog. Do you show the connection that we see here with Sarah and Pirate? Or is there a significant difference in your behavior that goes well beyond your voice? If you appear disconnected in your moments of silence, consider how you might change that! If you're not sure how to do that, ask yourself how you would be interacting with a human being who is talking while you are listening attentively. While a successful competitor, Denise's real passion lies in training dogs and solving the problems that her own dogs and her student’s dogs present. She is a recognized expert in developing drive, motivation, and focus in competition dogs, and is known internationally as an engaging speaker and an expert in no force training for sport dogs. She has consistently demonstrated the ability to train and compete with dogs using motivational methods in sports where compulsion is the norm. In addition to training and speaking, Denise is a prolific writer. You can find her at www.denisefenzi.com where she maintains an active blog on all things related to dog training. She is also an active writer on facebook; follow her there to learn more about her range of interests in addition to dog training. Denise and Deb Jones have recently finished a four book series, "Dog Sports Skills" which has recieved widespread acclain in the dog sports community. In addition, she has written additional books on her own, including "Train the Dog in Front of You", "Beyond the Back Yard; Train Your Dog to Listen Anytime, Anywhere!" and, for the younger audience, "Blogger Dog, Brito!" Several of these books have won Maxwell awards for Best Training and Behavior book from the Dog Writers of America.